Combine the chocolate chips and shortening in a microwave safe bowl, preferably glass and something not too tall or big. Microwave for about 2 minutes on high. (You can do it on the stove top if you don’t want to use the microwave!) Remove chips and stir until they are smooth. 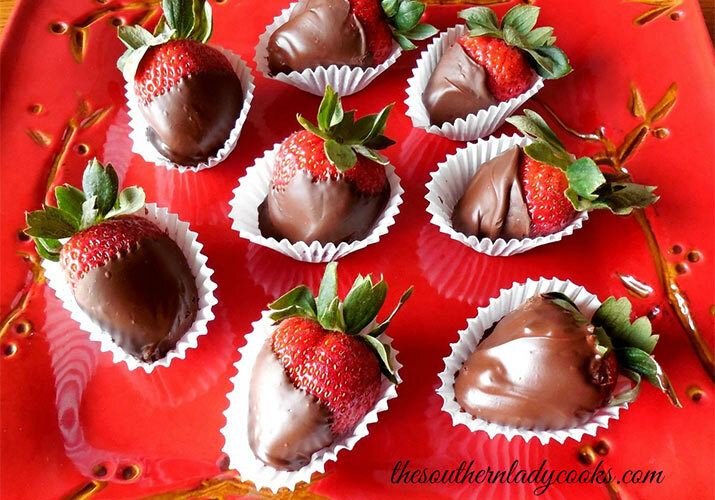 Dip strawberries in chocolate and place on plastic wrap. I just use my fingers when dipping, but you could insert a toothpick in the top of the strawberry and dip that way. Let chocolate harden on the berries. You can put in refrigerator or a cool place about 35 minutes. If you want white stripes on the strawberries, melt white chocolate chips and drizzle over the chocolate. You can use sprinkles, sea salt, do half white and half dark chocolate, sprinkle on nuts or whatever you like. One cup of chocolate chips does about 15 to 20 strawberries, depending on the size of your berries. Beat liquid ingredients together with mixer; add dry ingredients. Beat 2 more minutes. Spray 2 round cake pans and bake in preheated 350 degree oven for 30 minutes until center is done. 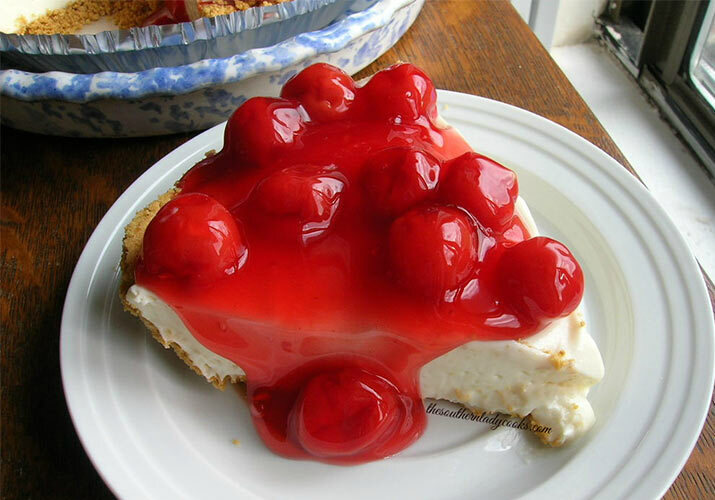 (This can be made in 4 layers or in 9 x 13 long pan. Whip all frosting ingredients together with mixer until smooth and of spreading consistency. Let cream cheese stand at room temperature until softened. In a medium bowl, beat cream cheese until light and fluffy. Slowly add condensed milk, lemon juice and vanilla, beating until smooth. Pour into crust. Chill at least 3 hours until firm and then top with cherry pie filling. Makes 1 pie. Enjoy! Judy Yeager of The Southern Lady Cooks had no idea when she started her food blog in 2008, she would have such an amazing following... 800k and growing on Facebook! She loves to feature many traditional Southern recipes, along with family recipes and dishes created in her Kentucky Kitchen. She has two published cookbooks and a third on the way! 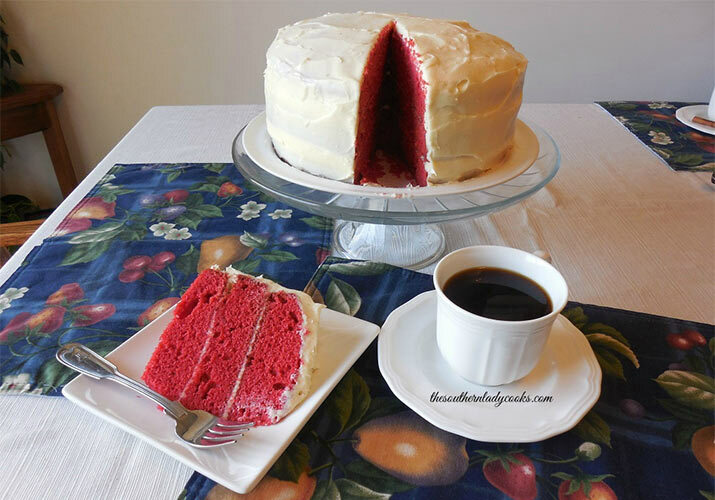 For more great Southern Lady recipes, visit www.TheSouthernLadyCooks.com!